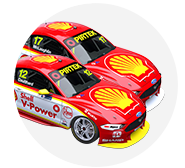 Scott McLaughlin continued his dominance of ARMOR ALL Qualifying at the Coates Hire Ipswich SuperSprint despite a late scare in traffic. McLaughlin shot to the top of the order on his first green tyre run with a 1:08.82s lap before heading out early for his final attempt. The strategy proved to be a mistake, however, as the #17 Shell Ford came across the bulk of the field on its flying lap. Dodging cars down the back straight, McLaughlin managed to set the quickest first sector time before finally backing off as he came across Alex Davison on the run to Turn 4. Failing to improve on a subsequent second lap on his tyres, McLaughlin relied on his earlier time to hang onto pole by just 0.0089s from a resurgent Craig Lowndes. CLICK HERE for the full Race 15 Qualifying result. “When I was driving out of the pits I thought this is a really early call,” said McLaughlin. “I was a bit nervous there coming through the pack. I got through the first straight but the second one was just too sketchy and I backed out of it. Lowndes had qualified 18th or worse for six of the last seven races but turned around his poor one-lap form in impressive fashion. “It’s great to be on the front-row again. I don’t know if we’ve completely unlocked this tyre but we definitely have for here,” he said. “We’ve been working hard through practice to make sure the car rides the bumps and gets its power down well. A late effort put Chaz Mostert third ahead of Practice 3 pace-setter Tim Slade and the second Prodrive Ford of Mark Winterbottom. The Bottle-O Ford had been just 26th in final practice before a broken anti-rollbar was discovered in the Bottle-O Ford. Nissans and Red Bull Holdens filled the next four places in the order of Rick Kelly, Shane van Gisbergen, Michael Caruso and Jamie Whincup, while Cameron Waters completed the 10. Whincup had also been down the order in practice and said recently development work is proving a step backwards at this circuit, despite it being his team’s test venue. “The last few rounds we’ve been pretty radically different to what we normally are and it’s sort of paid off but this weekend it probably hasn’t,” he said. “We’re just persisting. Sometimes to make steps forward you have to make a step back which I feel like we did today. 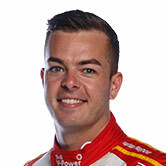 Fabian Coulthard’s qualifying woes from Townsville continued in 14th, 0.33s from his pole-winning team-mate. The battle of the wildcards was won by Todd Hazelwood in 20th while Jack Le Brocq, James Golding and Shae Davies filled 24th through 26th.